The term “Friendsgiving” first entered my lexicon the November after I graduated from college, when my friend Megan organized a small army of twenty-somethings for an afternoon of touch football and a seasonal feast. Megan roasted a turkey and welcomed her guests to fill in with the remaining components of a traditional Thanksgiving meal. Many of us were new to cooking, so we leaned on family members for the tried-and-true recipes behind our holiday favorites. Then, like every good student, we shared notes! Safely stowed in my recipe box all these years later are splattered index cards with instructions for the perfect pound cake and foolproof stuffing for a crowd. Highlighted by its crispy edges, my mom’s stuffing has long been a family favorite and is always the first serving bowl to be scraped clean on turkey day. 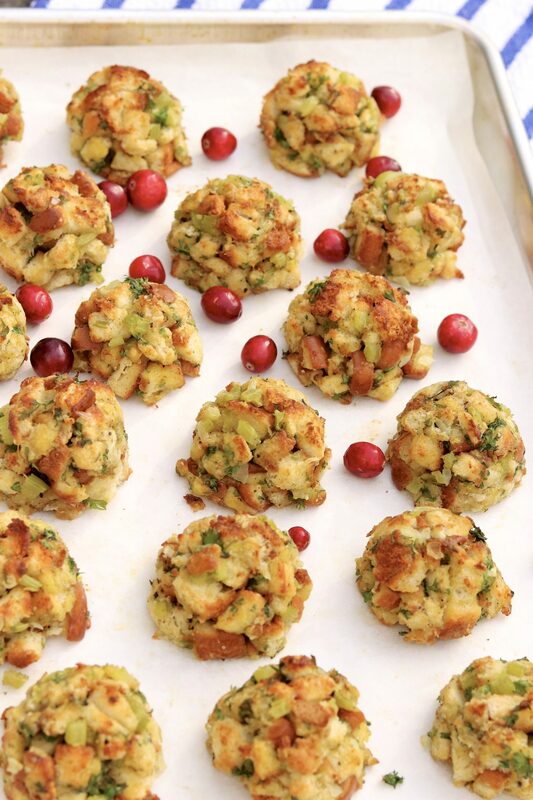 Consequently, when I first laid eyes upon a friend’s baking sheet lined with row upon row of stuffing balls, I considered them to be a small stroke of genius. The easy-to-assemble recipe stands well on its own or can be used to shore up what’s cooked in the turkey. The meatball-sized rounds ensure a good ratio of tender insides to lightly crisp exterior, and many appreciate the built-in portion control. The basic recipe allows for customization, can easily be multiplied, and may be prepared in advance – all winning qualities that prove especially helpful amidst extensive holiday meal preparation. Last fall one of my sons experienced his first Friendsgiving, and it was no surprise that he chose stuffing balls as his contribution. In the process, I came to appreciate the tried-and-true recipe for yet another reason. As he headed out the door, I noticed an unopened can of chicken broth on the counter and sunk at the realization that I forgot to include it. Thankfully, nobody knew the difference and, true to form, the stuffing balls vanished quickly. Though I usually abide by the basic recipe, my omission, combined with a list of options below, shows that this crowd-pleasing alternative to the usual stuffing is as flexible as it is forgiving. 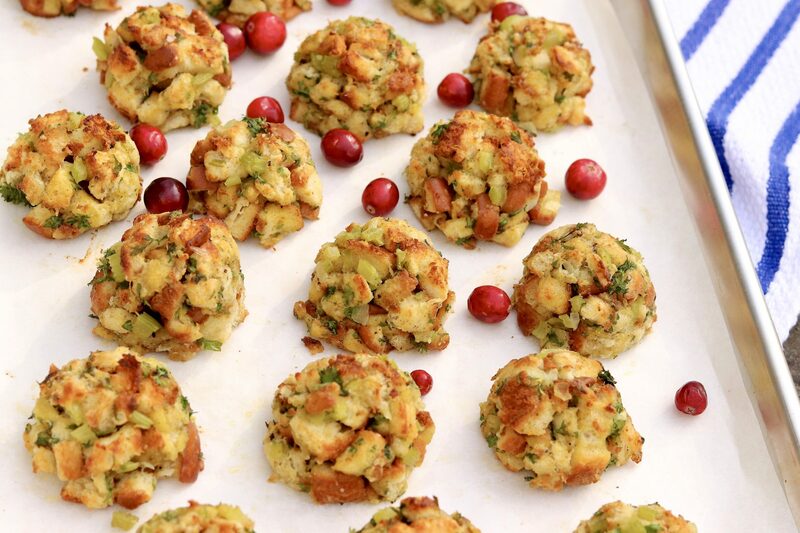 Enjoy this clever, portion-controlled side dish all season long – or form slightly smaller balls and serve as a festive appetizer with cranberry relish or another condiment of choice for dipping. Line a baking sheet with parchment paper or lightly greased foil for easy cleanup. Melt the butter in a large skillet over medium heat. Add the celery and onion and sauté until soft. In a large mixing bowl, combine the remaining ingredients with the celery and onion mixture. Toss to evenly distribute the seasonings and to ensure the bread cubes are evenly coated with the wet ingredients. Shape mixture into 8-10 balls. I use a large ice cream scoop, gently packing the bread (yet not mashing too hard) so the balls stick together. You can also do this with your hands, dampening them with cold water to prevent sticking if necessary. Bake for 20 minutes, give or take a few minutes, depending on oven and precise size of the balls, or until set and lightly golden. *I think the crusts enhance the texture of the stuffing balls, so I use them. I often double the recipe, using one (16-ounce) loaf of original Pepperidge Farm white bread. A sturdy, white bread is preferred, as the texture when whole wheat bread is used can be slightly mushy. I have also mixed in odds and ends of leftover hamburger and hot dog rolls. *My preferred gluten-free bread for this recipe has been Udi’s, but I recently tried Three Bakers with excellent results. As with regular bread, when using gluten-free bread I recommend white over multi-grain varieties. 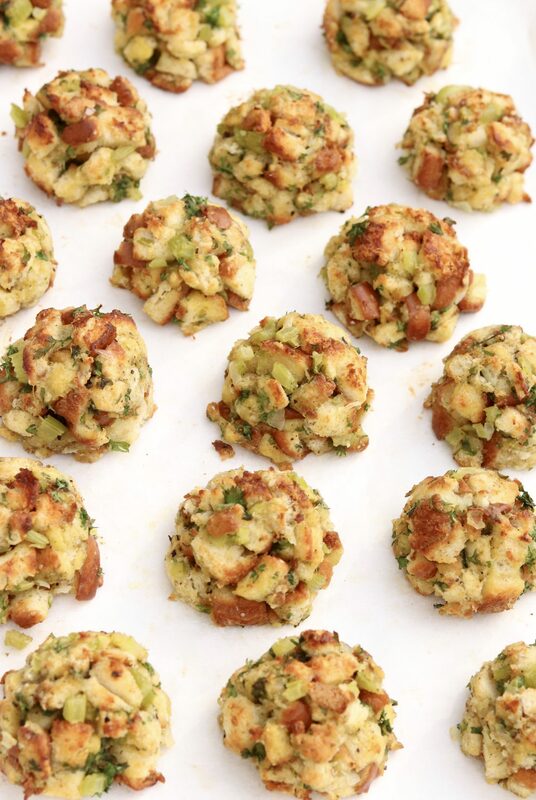 •A delightful accompaniment to a holiday meal, these stuffing balls also complement a variety of poultry and pork dishes quite nicely. 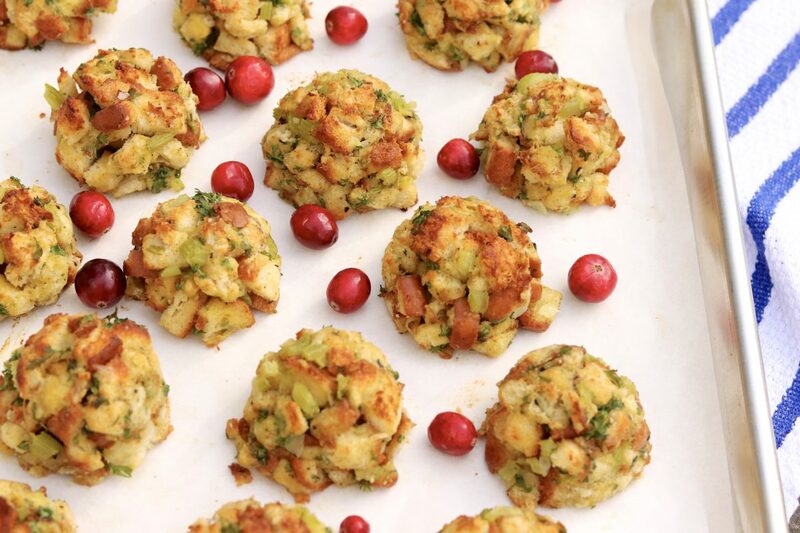 •For an appetizer, form smaller stuffing balls, reduce the baking time accordingly, and serve with your favorite cranberry relish or another condiment of choice dipping. •I recently used a scant scoop (of the large ice cream scoop mentioned above) and got a yield of 14 balls that were still a nice portion. In my oven, this size looked nicely golden after about 16 minutes. •I like to keep a 4-pack of 8-ounce chicken broth boxes in my pantry, as they are ideal when recipe calls for a small amount of broth. You could also dissolve a soup base like Better Than Bouillon in warm water. This sounds wonderful. 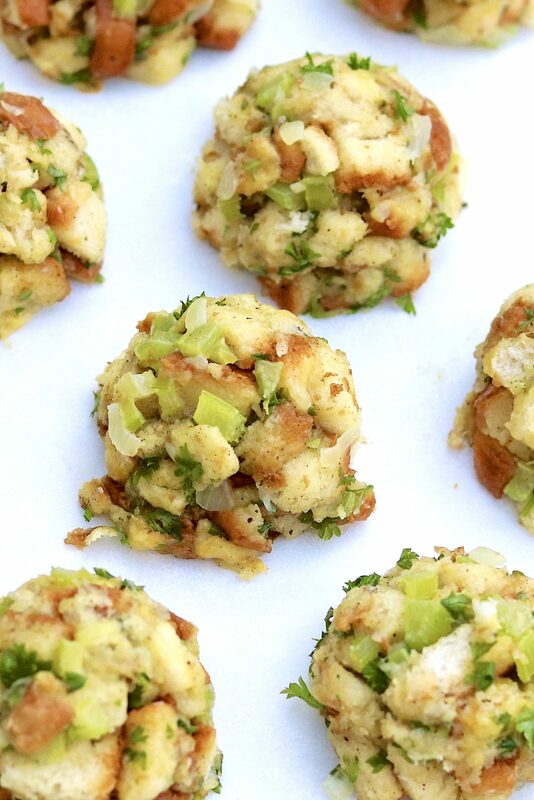 I’m to bring stuffing for Thanksgiving and I’m thinking I would like to make these. Have you ever added sausage to this recipe? If so, how many ounces do you think? Thanks in advance. Hi Elaine, I think sausage would be a lovely addition. I haven’t made them that way, but I’d probably start with about 8 ounces, breaking it up into very small pieces it cooks. That way you’ll get more even flavor throughout with a relatively small amount of sausage. You could likely add a little more, but I’d rather start on the low side and to make sure the balls hold together and the flavor is balanced. If adding sausage, I think I’d reduce the salt by 1/4 teaspoon or so, since the sausage will provide added seasoning. I hope that helps, and I’d love to hear how you make out! 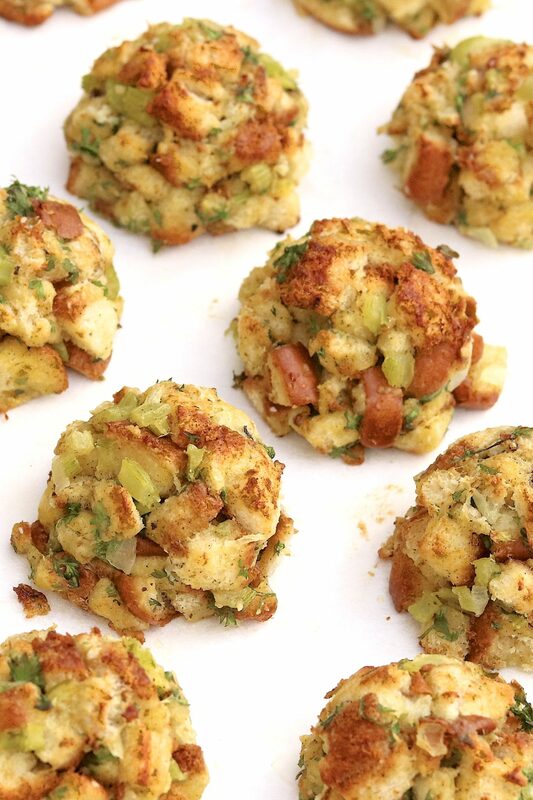 I’m slow to report but I made these on Thanksgiving to supplement my regular stuffing that I cook in the turkey, and dare I say everyone liked these better! Crispy edges for all and there’s a definite fun factor. Thanks for a new addition to our holiday meal that will be repeated! Oh, I did make them (and baked too) the day before and that worked out well. I love the crispy edges, too! 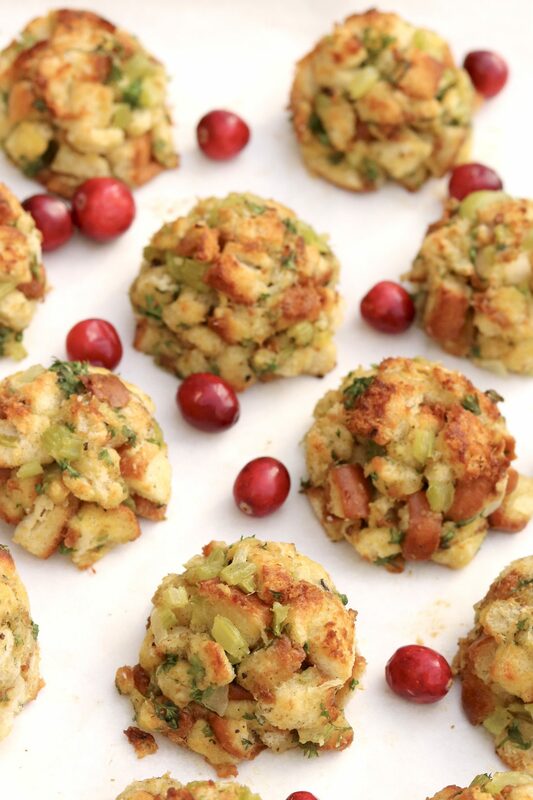 I’m thrilled these were a hit and will be a recurring dish on your holiday table! I can’t wait to try this for Christmas dinner. I normally make my mom’s recipe on Thanksgiving which is relatively like yours. However, she always added in the giblets from the turkey, which added a layer of flavor. We pat ours out into little patties, but again basically the same concept. Merry Christmas. There are some people in my family who would love that addition. Thanks for mentioning, Lisa, and Merry Christmas to you, too!